Subacute sclerosing panencephalitis (SSPE) is a progressive neurodegenerative disorder caused by a persistent infection of the brain by an aberrant measles virus. Its incidence remains high in developing countries like India. Atypical presentations are known. We report an 8-year-old boy with SSPE, who presented with rapidly progressive dystonia. An 8-year-old boy, born to a non-consanguineous couple, presented with abnormal twisting postures and loss of ambulation for the last 1 month. He had no adverse perinatal events and was developmentally normal. He started with abnormal twisting of lips and tongue with slurring of speech, drooling, and difficulty in swallowing. Subsequently, he developed twisting postures of upper limbs, then trunk, and lower limbs. He lost ambulation and became bedridden within 4 days of onset of symptoms. His cognition, hearing, and vision were preserved. There was no history of measles. The family history was unremarkable. Examination revealed bradykinesia, generalized dystonia, prominent orofacial-dyskinesias, rigidity in all four limbs (most marked in the left upper limb) and preserved muscle stretch reflexes. Bilateral ocular fundii were normal with no Kayser-Fleischer ring More Details. Investigations revealed a normal hemogram, liver and kidney function tests, normal serum creatine kinase, and normal arterial blood gas, lactate, and blood ammonia. Magnetic resonance imaging of the brain was normal. Serum copper and ceruloplasmin along with 24-hour urinary copper were normal. Urinary gas chromatography-mass spectroscopy and plasma acylcarnitine profile were normal. There was no response to oral L-Dopa. The child showed some improvement on transient midazolam infusion, trihexyphenidyl, oral diazepam, and physical rehabilitation. In view of rapid-onset dystonia with cranio-caudal gradient of progression, preserved cognition and normal magnetic resonance imaging of the brain, a possibility of rapid-onset dystonia Parkinsonism More Details (Dystonia 12) were kept and genetic studies were planned. After 1-month of onset of symptoms, the child developed generalized myoclonic jerks with deterioration in cognition. 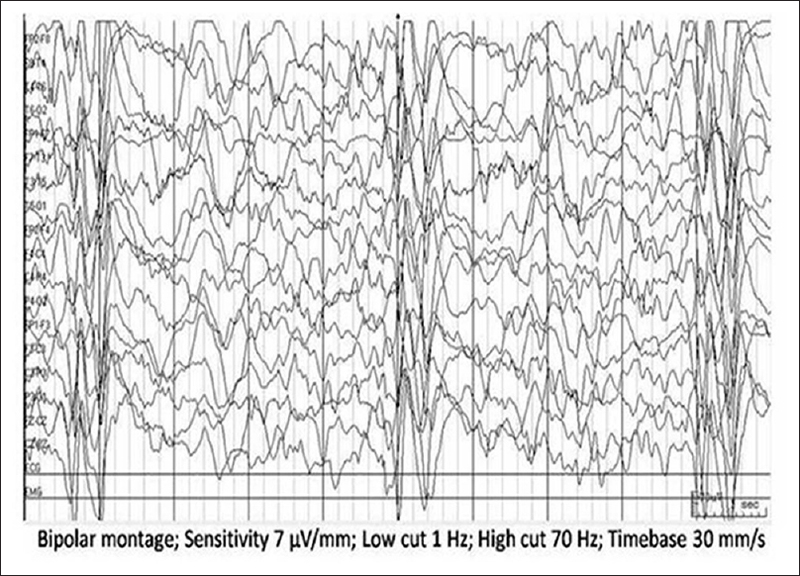 The electroencephalography (EEG) showed generalized periodic epileptiform discharges [Figure 1]. Immunoglobulin G (IgG) antibody titer against measles was 104.0 in serum (normal <2.0) and 128.0 in cerebrospinal fluid (CSF) (normal <2.0). Human immunodeficiency virus (HIV) serology was negative. A diagnosis of SSPE was made. Oral valproate was added along with isoprinosine. The child showed no response to the medication and showed a gradual deterioration. SSPE is known to mimic common neurological disorders. Various atypical presenting features reported in the literature include psychiatric features, vision loss, acute demyelinating encephalomyelitis (ADEM), neuromyelitis optica-like presentation, presentation resembling that of pseudotumor cerebri, tumor-like presentation, and even tics. Our case presented with status dystonicus and ran a fulminant course. Status dystonicus as a presenting feature has not been reported previously. Our case closely mimicked rapid onset dystonia Parkinsonism (Dystonia 12). It is an extremely rare dystonia plus syndrome caused by mutation in ATP1A3 gene. It is characterized by abrupt onset of dystonia and Parkinsonism (over minutes to days) with cranio-caudal gradient of progression and prominent bulbar findings. Dystonias are common in SSPE. They usually present at a later stage of the disease (Jabbour stage III). Status dystonicus has been described rarely in SSPE. Yis  reported status dystonicus with myoglobulinuria in a 14-year-old boy diagnosed with SSPE 2 years prior to the onset of status. Our case was atypical as status dystonicus was the presenting feature. The myoclonus in SSPE has been described as slow myoclonus, hung myoclonus, and even epileptic spasm. More recently, it has been described as periodic dystonic myoclonus. Involvement of the sensorimotor integration mechanism  and basal ganglia ictal activity have been proposed as possible mechanisms. The putamen is known to be preferentially involved in SSPE besides the occipital lobes and the medial thalamus. Early and preferential involvement of basal ganglia may explain the clinical course in our patient. Thus, one must be aware of the atypical presentations of SSPE, especially in a developing country. A high index of suspicion is required for its diagnosis. This report further expands the phenotypic spectrum of SSPE. Gutierrez J, Issacson RS, Koppel BS. Subacute sclerosing panencephalitis: An update. Dev Med Child Neurol 2010;52:901-7. Yiº U. Status dystonicus and rhabdomyolysis in a patient with subacute sclerosing panencephalitis. Turk J Pediatr 2012;54:90-1. Oga T, Ikeda A, Nagamine T, Sumi E, Matsumoto R, Akiguchi I, et al. Implication of sensorimotor integration in the generation of periodic dystonic myoclonus in subacute sclerosing panencephalitis (SSPE). Mov Disord 2000;15:1173-83.